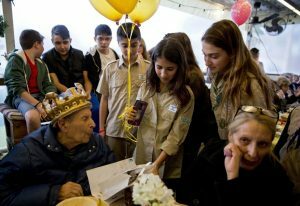 AP — Surrounded by more than 100 fellow Holocaust survivors and young volunteers, a blind Ernest Weiner sat in his wheelchair with a puffy crown on his head as the crowd sang happy birthday and showered him with hugs and greetings. Widowed and childless, 92-year-old Weiner lives alone and the cheerful gathering offered him one of life’s most valuable commodities — company. As home to the world’s largest survivor community, Israel is grappling to serve the needs of thousands of people like Weiner who are living out their final days alone. Various government bodies and private organizations chip in to offer material, psychological and medical support to the survivors, still scarred by the horrors they experienced 70 years ago. But all agree that the greatest burden late in their lives is loneliness. “It’s not pleasant to be alone,” Weiner said in his apartment south of Tel Aviv. “It gives a good feeling” to have people visit. Some 160,000 elderly survivors remain in Israel, with a similar number worldwide. In Israel, about half receive special government stipends, but a third still live under the poverty line, well above the national 20 percent poverty rate. That’s where the nonprofit sector gets involved. The Association for Immediate Help for Holocaust Survivors was established nine years ago for the purpose of aiding survivors anywhere in Israel, at a moment’s notice. Run solely on donations, it currently has some 8,000 volunteers around the country. They help survivors with everything from legal assistance to paying their bills, buying their groceries to driving them to doctor appointments. Several times a year, they throw parties that become a highlight on survivors’ calendars. The care continues even after death. The association’s modest office currently houses a number of orphaned dogs and cats left behind by their owners. Six million Jews were killed by German Nazis and their collaborators during the Holocaust, wiping out a third of world Jewry. Israel’s main Holocaust memorial day is in the spring — marking the anniversary of the Warsaw Ghetto uprising — while the United Nations designated Jan. 27 as International Holocaust Remembrance Day, commemorating the date of the liberation of the Auschwitz death camp in 1945. As the senior adviser to former finance minister Yair Lapid, Naama Schultz spearheaded the ministry’s efforts to boost previously paltry funding to those who survived camps and ghettos. Besides a monthly stipend, the state also provides expanded health care, free medication and discounts on various living expenses. But Schultz said money couldn’t address their emotional needs. Many survivors kept their pasts to themselves for decades, often alienating even the people closest to them due to their trauma. Only in their final years are many finally ready to open up, and often then there is no one around. “There is always more you can give them, but what they really want most is someone to just be with them,” she said. Plenty of organizations try to answer that need by matching soldiers and students with survivors. One highly publicized initiative offered university students rent-free accommodations in return for living with lonely survivors and keeping them company. Noga Rotman, a 32-year-old computer science student, said she decided to get involved several years ago when her grandfather, a Holocaust survivor, became ill.
Weiner said he especially appreciated the company of youngsters. As for fellow survivors, he had mixed feelings. When the Nazis invaded his native Austria, Weiner and his sister fled to Holland while their parents stayed behind and died of illness. The rest of the family perished. After the Nazis occupied Holland, they were placed in the Westerbork transit camp, from where his sister was sent to her death in Auschwitz. Thanks to his work as an electrician, Weiner got to know the camp well and estimates he escaped deportation about 15 times, once after he was placed on a train for Auschwitz. But the harsh conditions took their toll. In the course of his work, he got so many electric shocks that it caused heart damage, and an accident blinded his right eye. Diabetes later deprived him of sight in his left eye and confined him to a wheelchair. Now that his wife is gone, Weiner has a caregiver who stays with him and another who visits daily. But the volunteers who arrive several times a week provide most of the conversation. At the party, children handed him drawings. Soldiers and scouts gave gifts, and there was even a surprise visit from Israeli supermodel Bar Refaeli — who heard Weiner was a fan and stopped by to snap some pictures with him. But the most moving moment was when a Dutch-speaking volunteer whom he has grown close to leaned in to let him know she was there. He teared up, and then she did too. Tel Aviv’s Rabin square was a site of a rare form of protest on Sunday when a pile of shoes was placed in the square to symbolize Holocaust survivors’ dire conditions. Tal claims that the government has received huge amounts of money from Germany which it chose to invest in infrastructure. “There are 200,000 Holocaust survivors that live in poverty and desolation in Israel. We need to see to it that the money reaches those who helped establish the state,” he says. More than 150,000 applications have been submitted for restitution of Jewish owned property lost during the Holocaust. The number was reported by Project HEART — the Holocaust Era Asset Restitution Taskforce, which seeks to help individuals with restitution for property that was confiscated, looted, or forcibly sold during the Holocaust. It is a nonprofit initiative of the Government of Israel in cooperation with the Jewish Agency for Israel and numerous other groups. “Many Jewish Holocaust survivors had property confiscated, looted or forcibly sold by the Nazis or their collaborators during the Holocaust era and most have received no compensation for their lost assets,” Bobby Brown, executive director of Project HEART, said in a statement. Project HEART formed in February 2011. By December that year, due to the overwhelming response of Holocaust survivors and their heirs, Israel’s government decided to extend the deadline for submitting questionnaires regarding their eligibility to gain restitution or compensation for the property they or their relatives lost during the World War II era. GRINNING and waving, 14 women who survived the horrors of World War II have paraded in an unusual pageant, vying for the honour of being crowned Israel’s first ”Miss Holocaust Survivor”. Billed by organizers as a celebration of life, the event has also stirred controversy. In a country in which millions have been touched by the Holocaust, many argued that judging ageing women who had suffered so much on physical appearance was inappropriate and even offensive. HAIFA — Estee Lieber was in a bit of a tizzy as she emerged from under the blow-dryer for the final walk-through on Thursday evening. “I don’t like it straight,” she complained. Hava Hershkovitz, 78, from Romania, was crowned as the pageant winner. Her prize was a weekend at a five-star hotel. This was the first beauty pageant for Ms. Lieber, 74, who was born in Poland in 1937, was 5 when her father was killed by the Nazis in Germany, and 6 when her mother faced the same fate. It was the first time down the runway for all 14 finalists, in what was billed as the first-ever pageant of Holocaust survivors. They wore sensible shoes, and no swimsuits. Personal stories counted as much as poise. A beauty pageant for Holocaust survivors was held in Haifa, featuring female survivors walking down a red carpet and sharing details of their travails during World War II. Fourteen women, aged 74 to 97, participated. Hava Hershkovitz, 79, who had fled her native Romania to survive the Shoah, was crowned the winner. Organizers called the event a celebration of life, but critics denounced it as trivializing the horrors of the Holocaust. The 14 finalists had been chosen from hundreds of applicants based on their personal stories and later roles in their communities in Israel, according to the BBC. Eliezer Ayalon, a veteran tour guide for Jewish Federation missions, died late last month. Born in Radom, Poland in 1928, Ayalon was the only child from his family to survive the Holocaust. He spent a year in the Radom Ghetto and then three years in five different concentration camps in Poland and Austria, among them Plaszow and Mauthausen. Shortly after being liberated from a camp in Austria in May 1945, he made aliyah to Israel through the Jewish Agency for Israel’s youth aliyah department. He served in the Israeli army, fighting in the 1948 War of Independence. He then became a tour guide, but it wasn’t until a 1981 meeting with fellow Holocaust survivor Elie Wiesel that he began sharing his story, becoming a docent at the Holocaust History Museum at Yad Vashem and lecturing at conferences and universities in the United States and Israel.